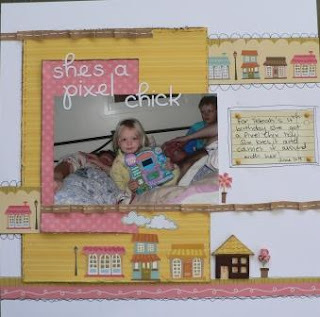 The second DT kit I was sent from Enchanted scrapbooking was the Enchanted houses - divine papers from My little shoebox and I LOVED playiing with the houses and cute papers and even a full tube of Heidi swapp paint! Wahoo!!! I think this kits has SOLD OUT already - but get over there and take a look cos they have awesome kits and they move QUICK!!! Love those LO's just great.